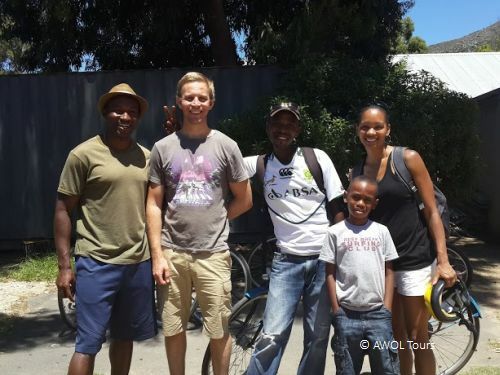 This month AWOL Tours welcomed a family from Ontario on the Fair Trade accredited AWOL Township bicycle tour. Serge and Nicole wanted to introduce their seven year old son Noah to new cultures and another way of Cape Town living. 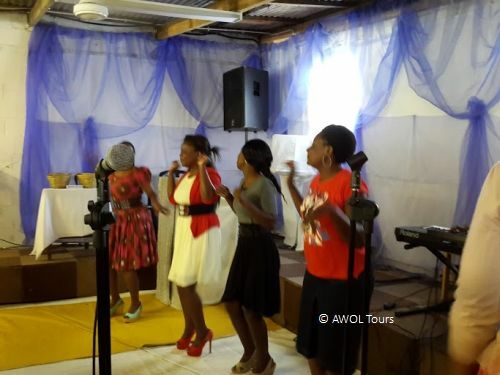 They decided to book the tour on a Sunday morning despite some local highlights being closed for the weekend but Masiphumelele never really closes! As our local guide Zwai helped us select bikes, he explained the cultural and political history of the community. 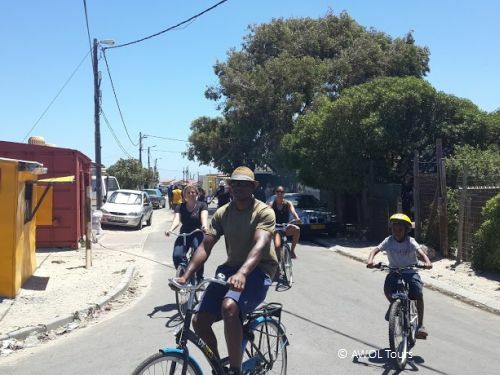 Noah might have looked nervous testing out his bike but he was soon confidently pedaling behind Zwai and taking interest in the colourful houses and roaming chickens. On a Sunday morning every street is alive with songs of praise, church going is an integral part of this community and everybody is invited. Little girls in pretty dresses clutching bibles carefully dodged us as we parked outside Zwai’s church where we were invited to listen and take part in the service, within a few minutes of finding seats we were on our feet dancing, and smiling, the choir and preacher joyously welcoming members of the congregation into this small home now a church with drums, keyboards, and swaying bodies clapping and stamping to beloved and hypnotic hymns. This is every reason to visit Masiphumelele on a Sunday. After refreshments at a well-stocked corner store, Zwai lead us between houses and shacks closely built together in the informal settlement. In the humble homes of the Sangoma (Traditional healer) we were introduced to a different devotion, the story of ancestor worship, herbs and traditions shared through the ages to the beat of the drum around fires.